For immediate download: Omino Python Plug-in for After Effects. This plug-in lets you write a script in Python and then run it on every frame. The script can do drawing, access other layers, and so forth. Because sometimes, you just need to write code to get the job done. Omino Python gives you a straightforward way to provide drawing code directly in your After Effects work flow. This isn’t for everyone; but if you have a little bit of scripting experience, Omino Python should be very easy for you to pick up. Here’s another youtube demo, too. The download includes plenty of documentation, or you can read it right now. I’ll be posting some tips and examples — there are so many possibilities opened up! — but to break the ice, here’s a simple Omino Python script to do some drawing. Your script can access a collection of parameters — some floats, some colors, &c — and use them as needed. 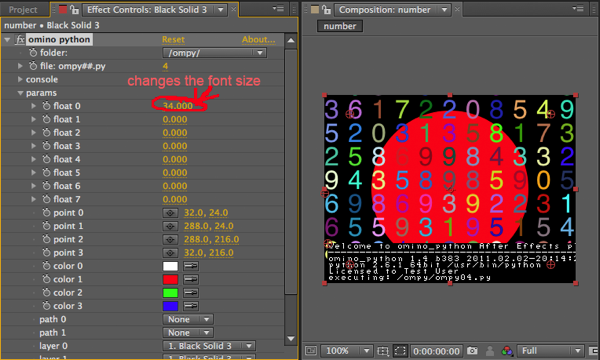 In this case, I just used one float parameter to control the size of the random numbers printed. This is just the beginning! Read the doc for the full story. Try out the plug-in. How about integrate this with http://code.google.com/p/pybox2d. Is it theoretically posible ? Wanting to try out the plugin. Its throwing this though. A little bit late, I reply: Try the newest version, fresh today. I rejiggered the installer significantly, hopefully addressing exactly this kind of problem. But please ping me here or poly@omino.com, I want to help!